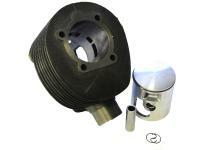 Cast-iron racing Cylinder Kit from Polini for Vespa 208cc with 7 ports, stroke 57mm, w/o cylinder head, Ø 68,0mm. For race use only. Steam hammer POLINI punches it is 208cc with brutal power out of the basement instead of simply speed. POLINI Pulls through alpine passes or quarter milers like a freight train! Urban street cowboys with a penchant for wheelies and powerful starts will have fun with this, tour pilots on extended tours or longer full throttle trips should try a 28/30mm carburetor. POLINI has been called undependable by some, though we beg to differ. Although, piston play is cut pretty close with 10/100mm, even an original PIAGGIO cylinder has 12/100mm piston play. Here, you will get a torque tractor with plenty of power direct from down below. This kit is delivered without a cylinder head. A modified cylinder head is especially important with POLINI, in order to avoid thermal overload! Best would be a MMW head. To assure better heat dispersion, spray the cylinder black. Vespa 200 Rally/P200E/PX200 E/Lusso/ 98/MY/Cosa 200.